Content questions test students’ comprehension of each chapter’s Latin reading, background material, and grammar/syntax presentations. Translation exercises from Latin to English and from English to Latin improve students’ abilities to read and write Latin. 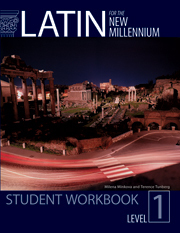 Student Workbooks expose students to adapted Latin passages not only from authors introduced in the primary text but also from other authors not presented in the textbook.